Item # 307484 Stash Points: 2,995 (?) This is the number of points you get in The Zumiez Stash for purchasing this item. Stash points are redeemable for exclusive rewards only available to Zumiez Stash members. To redeem your points check out the rewards catalog on thestash.zumiez.com. Laidback and simple, Vans presents their youth sized Redmond Navy, Red and White Striped Pocket T-Shirt. Featured with a multi-colored striped design throughout, this striking tee pairs well with jeans and chinos alike that's finished with a convenient left chest pocket. 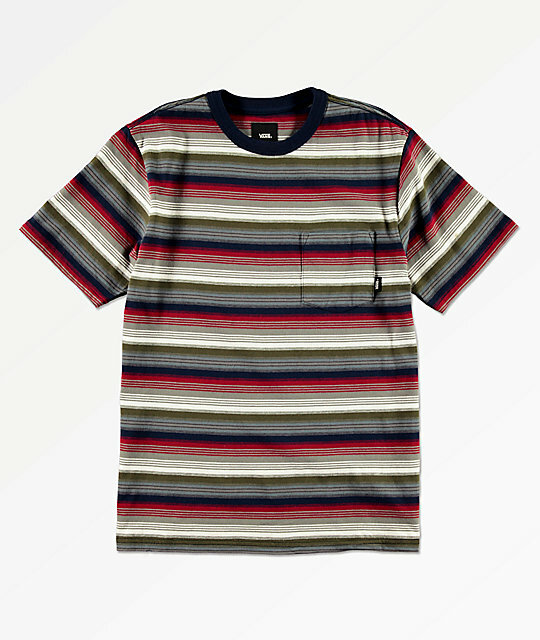 Redmond Navy, Red and White Striped Pocket T-Shirt from Obey. Horizontal navy, red, white, grunge brown and light blue striped design. 25.5" (65cm) from the shoulder to bottom hem on youth size Large.